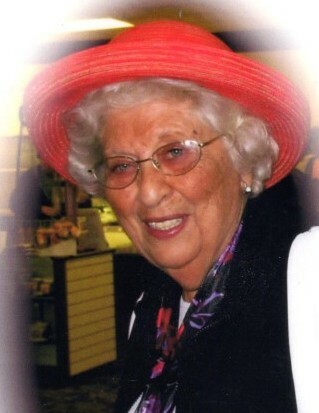 Ida Theresa Scaccio (née Capozzoli) died peacefully in her home with her family by her side on November 28, 2018 in Tallmadge, Ohio at the age of 97. Ida is survived by her children, John Scaccio (Barb Zoller) of Rootstown, Linda (Paul) Fasick of Tallmadge, Ramona (Bill Perrie) Tallmadge, and Joe (Rose) Scaccio of Tallmadge; grandchildren, Paul II (Shari) Fasick, Zara Rose Scaccio, Carmen Dominic Scaccio; great grandchildren, Isabella Gail Fasick, Sophia Aida Fasick and Paul Fasick III; son in law, Ron Dickey. She is preceded in death by her husband, Carmen; daughter, Irene Dickey; sisters, Camilla Baltrinic and Angela Capozzoli; brothers, Dominic Capozzoli and Anthony Vincent Capozzoli; mother, Anna Marie and father, Raffele Capozzoli of Akron, Ohio. Ida was born on November 1, 1921 in Akron, Ohio to Raffele and Anna Marie Capozzoli. She was the youngest of 5 children in the Capozzoli family. She graduated from North High School and began a career in pen and ink fashion art. However, when the men were being called to war, there was a need for pen and ink artists in the war industry. Ida took her art skills and went to work for Firestone as a lady draftsman drafting 40 mm bofor guns. Her contribution was so great she was listed in a book written about the era of women draftsmen. After the war was over she left Firestone to begin her family; marrying Carmen Scaccio on July 13, 1946. From here on, all her interests were put aside and she immersed herself in her greatest passion, raising her children and supporting her husband in all his career endeavors. Ida, even as the matriarch of the family, made time to focus on her own interests. Her husband Carmen was known as the businessman, but Ida was an entrepreneur all her own. She created the infamous ‘Pickle People’ jars that were sold nationwide. Ida also was an accomplished watercolor artist and often sold her work in art shows and stores throughout Ohio. Ida had a way of making friends of strangers and family of friends. She was warm hearted and open minded and loved conversation from all the people she would meet. Her smile was infectious and her warmth disarming. The world has lost one of the best it had to offer. Calling Hours will be 4:00 until 7:00 p.m. Friday, November 30, 2018 at the Donovan Funeral Home 17 Southwest Ave. (on the Historic Tallmadge Circle). Mass of Christian burial will be 10:30 a.m., Saturday, December 1, 2018 at Our Lady of Victory 73 North Ave., Tallmadge, with a reception to follow. Father Michael Matusz will officiate the ceremony. PROCESSION TO FORM AT THE CHURCH. All are welcome to attend and celebrate Ida's life. In lieu of flowers memorial contributions can be made to the City of Tallmadge “In Memory of Ida Scaccio”, for the Tallmadge Cemetery Improvement fund.